Martha Ragsdale was born on 26 February 1832 in Lawrence County, Indiana. She married Benjamin Murphy on 9 November 1848 at Lawrence County, Indiana. As of 9 November 1848,her married name was Murphy. Martha Ragsdale died on 31 July 1919 in Lawrence County, Indiana, at age 87. [S3406] Letter, Susan Lana (Frezell) Oetgen to Hunter Bagwell, December 16. 2014. Kelley Suzanne Oetgen is the daughter of Robert Mays Oetgen and Sydney H. Graham. Kelley Suzanne Oetgen married Richard Jack Jeffries in August 1997.1 Kelley Suzanne Oetgen and Richard Jack Jeffries were divorced after 29 September 1999.1 Kelley Suzanne Oetgen married Peggy Johnson on 6 June 2015. Robert Eric Oetgen is the son of Robert Mays Oetgen and Sydney H. Graham. Robert Eric Oetgen married Jennifer Ginner on 5 June 2004. Charles William Gifford was born on 17 March 1915 in Howard County, Indiana. 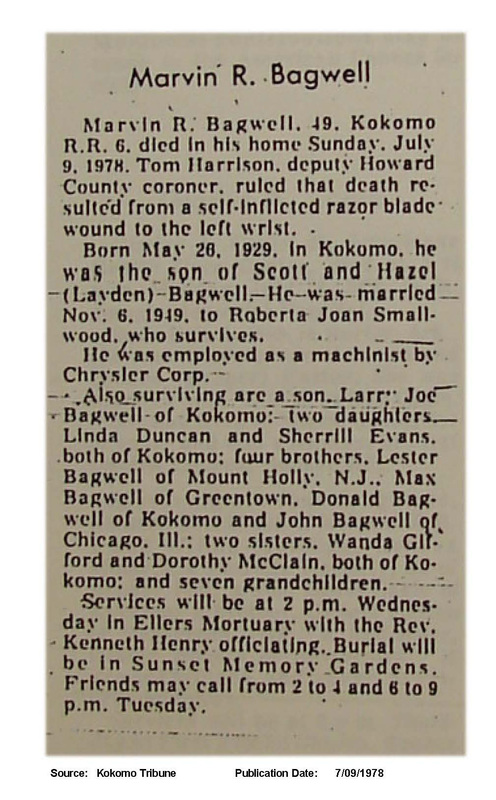 He married Wanda Maxine Bagwell, daughter of Parker Scott Bagwell and Hazel Dell Layden, on 14 February 1940 at Kokomo, Howard County, Indiana.1 Charles William Gifford and Wanda Maxine Bagwell were divorced. Charles William Gifford died on 21 December 1996 in Kokomo, Howard County, Indiana, at age 81. Melma K. Coy was born on 4 April 1929. She married James E. Bagwell, son of Garry Falson Bagwell and Mary Elizabeth Lorenz, on 4 August 1963.1 As of 4 August 1963,her married name was Bagwell. Melma K. Coy died on 6 December 2015 in Kokomo, Indiana, at age 86 Melma K. Bagwell, 86, Kokomo, passed away at 5:35 pm on Sunday, December 6, 2015, at Waterford Place Health Campus. She was born on April 4, 1929, in Tipton, the daughter of Nole & Catherine (Finnerty) Coy. She married James E. Bagwell and he preceded her in death on November 21, 1987. Melma was a 1946 graduate of Kokomo High School. She retired in 1984 after 34 years of service with Delco Electronics as a group leader. Melma was a member of UAW Local 292 and Daughters of the Moose Lodge. She supported several local charities such as WE Care and the Veterans. Melma was a talented artist, painter and loved to sew. She loved to travel and had lived in Florida for 20 years with her longtime boyfriend Gene Staton. Melma cherished the time she spent with her dogs, Izzy, Boo Boo, Parie, and Misty. Melma is survived by her nephew Steven Nevens, Kokomo; niece, Kathleen Staton Goodnight; great nieces, Shannon (Michael) Doster, Jennifer (Richard) Carter, Myrandi (Jeremiah) Plake, and Tiffany Goodnight and family; great nephews, Randy Owens, Michael Goodnite II and family; great great nephews, Brandon Meacham, Adonis (Julia) Doster, Jason Ferenc, Michael Ferenc, Randy Warner, Cameron Owens, Alex Owens, and Michael Zell; great great nieces, Breanna Ferenc, Carlie Owens, Faith Owens, Madison Owens, Destanie Zell, Jasmine Doster; great great great nephews, Jayden Doster, and A’den Warner; great great great niece, Kaitlinne Warner, along with Melma’s dearest friend, Wanda (Laverne) Utterback and her beautician, Michelle Doak. Melma was preceded in death by her parents, husband, James Bagwell, longtime companion, Gene Staton, sister, Eilene Goodnight, nephew, Michael Goodnight, three aunts, her most beloved dog, Izzy, along with many loved family and friends. Funeral services will be held at 1:00 pm on Friday, December 11, 2015, at Shirley & Stout Funeral Home & Crematory, 1315 West Lincoln Road, Kokomo. Burial will follow in Sunset Memory Garden Cemetery. Friends are invited to visit with the family from 11:00 am until time of service on Friday at the funeral home. Memorial contributions may be made in Melma’s memory to the American Cancer Society. Messages of condolence may be left online at www.shirleyandstout.com. She was buried at Sunset Memory Garden, Kokomo, Howard County, Indiana. Richard E. Bagwell was born on 26 October 1935.1 He was the son of Garry Falson Bagwell and Mary Elizabeth Lorenz.1 Richard E. Bagwell died on 4 May 1989 at age 53. Pat (?) married Garry Bagwell, son of Garry Falson Bagwell and Mary Elizabeth Lorenz, after 1945. Ava Lee Brock was born on 12 March 1926 in Heber Springs, Arkansas.1 She married Walter Max Bagwell, son of Parker Scott Bagwell and Hazel Dell Layden, on 19 March 1945 at South Bend, St. Joseph County, Indiana.1 As of 19 March 1945,her married name was Bagwell. Ava Lee Brock died on 21 March 2003 at age 77.